So I wondered, "What can I do to create a little controversy?" Then I had an idea. Yes, it concerns cookies... Older grade teachers don't check out yet, this lesson is not limited to the idea of parts of a whole. 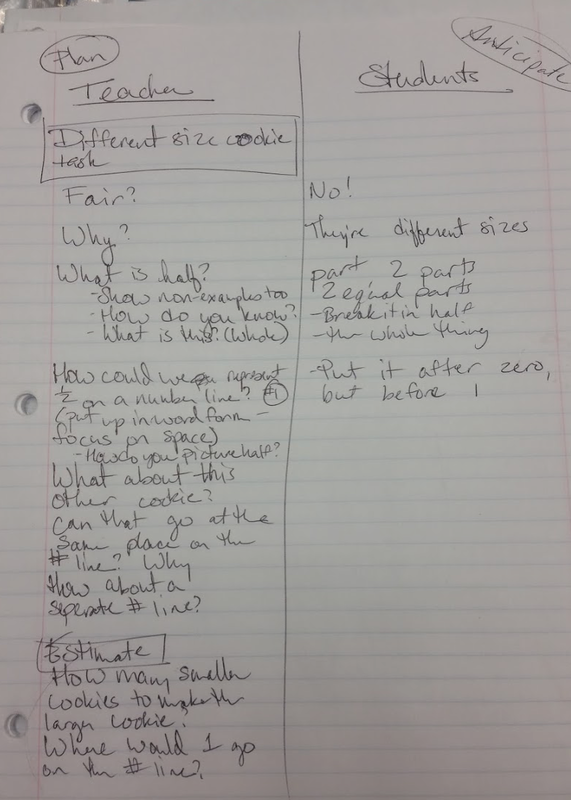 I began double planning teacher questions and some anticipated responses. Fast forward to today's lesson... I am wearing a leopard apron. Yes, I have a cookie crumb on my lip! Kids kept asking me why I was wearing an apron. I told them I had been up all night baking cookies, which was true. So, I called two students up to the front of the room to be my helpers. I told the kids I had two halves of cookies. I asked them if it would be fair if I gave them each half of a cookie. The cookies are hidden in a paper bag. The class all shouts out, "Yes!" So I give half of a small cookie to Amore and half of a huge cookie to Shawn. The uproar was on the border of out of control, but it's in the name of math, so... we kept going. 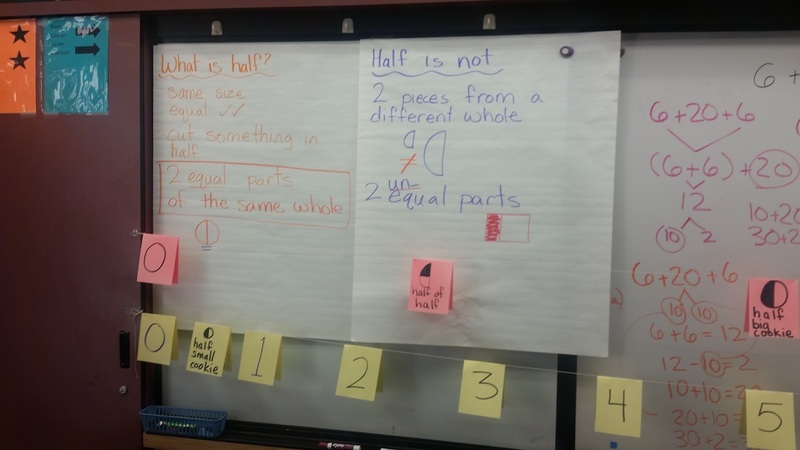 This argument begged a student created definition of what half is and what half is not. Don't worry, this is only the launch of the lesson. 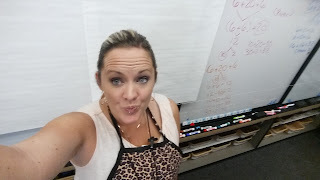 I know from listening to upper grade teachers and reading Van de Walle that students have a difficult time understanding fractions as numbers and not only parts of a whole. So I stole an idea that Andrew Stadel shared and used it in a different way. 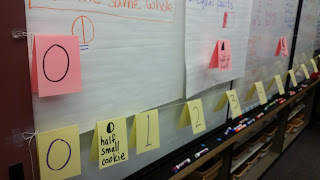 (BTW - this is an example of how elementary, even primary, can steal ideas from middle and high school teachers!) I put zero and one on a string number line and asked the kids where half would go. They partner talked their disagreements, but in the end it came out that half should be equidistant between zero and one. I chose to record the language of half in words. See the last sentence of the pic below. I held up one small cookie and one extra large cookie and asked the kids to choose a just right brave estimate for the question, "How many small cookies equal a large cookie?" 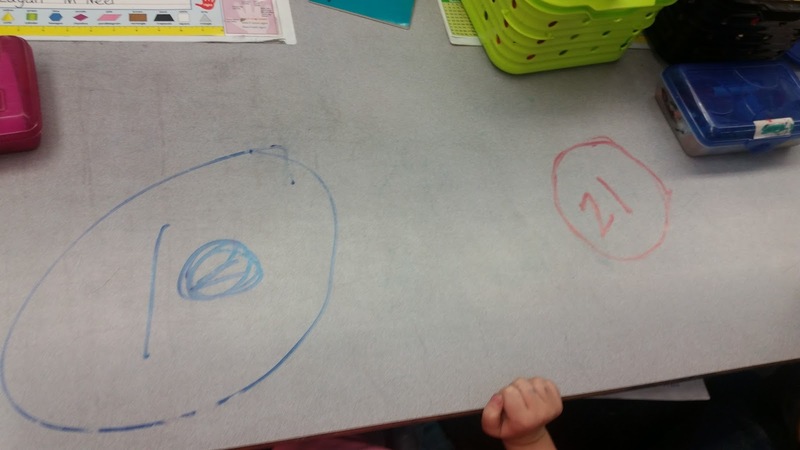 Students wrote their estimations on their desk with a marker. 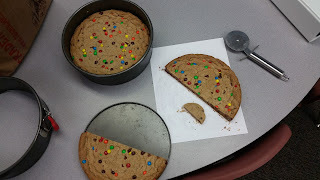 Then we laid out small cookies on the large cookie to see how many it would take. 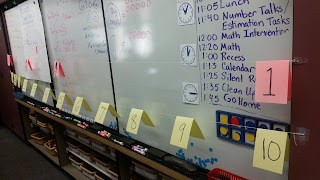 It turned out to be 10 so we added 2 - 10 to the existing number line. 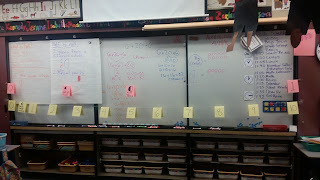 Then I strung up another number line directly above it and hung zero up above the other zero. This number line represents the large cookies. 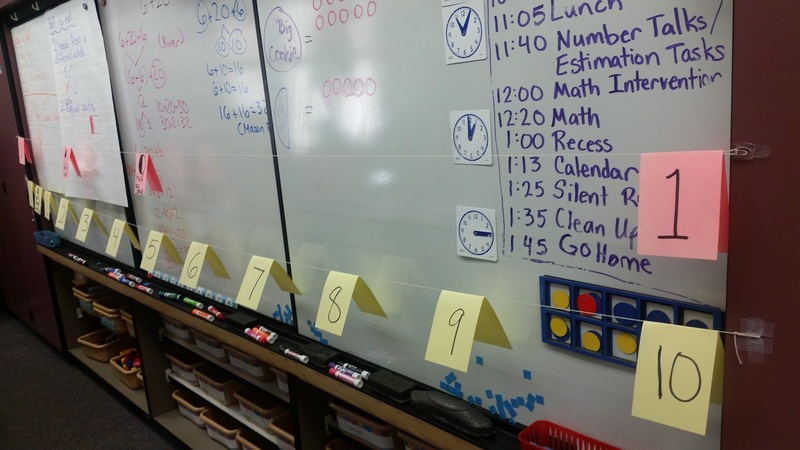 "Boys and Girls, if the yellow number line represents the small cookies and the pink represents the large cookies, where will the one go on the large cookie number line?" Kids whispered to each other. Brave ones called out, "Above the 10!" Me, "How do you know?" Kids, "Because it takes ten cookies to equal one big cookie." 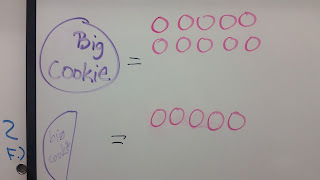 Hmm "Well, if that's true then where would one half of a large cookie go on the number line?" Kids, "Above the 5! Half way between the zero and the ten!" Kids, "Because 5 is half of ten. 5+5 is 10." Push: "If half goes here, where would half of half go?" Kids disagreed on this one. 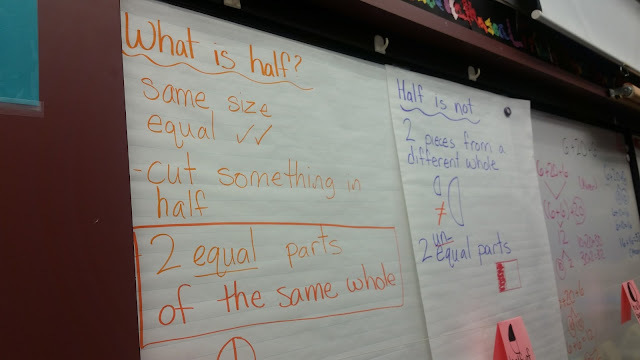 Some thought between half and one, but after some kids convincing each other, and a demonstration of breaking half into half they came to consensus that half of half is half way between zero and one half. 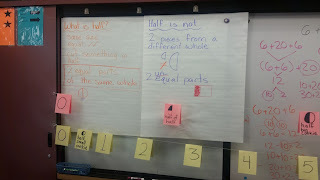 Kids created some examples and non examples of half and divided half into half again. 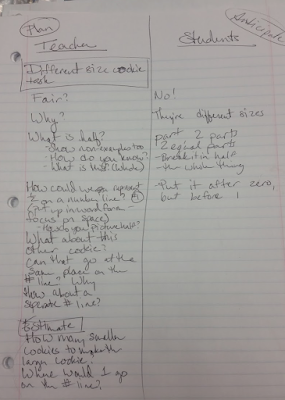 Tomorrow students will reflect on what they know so far about halves and wholes in their math journals. The next goal will be: "They should also reason that decomposing equal shares into more equal shares results in smaller equal shares." Thinking - What is the pattern and/or relationship between the number of parts and the size of the parts. We will continue to work on equal sharing tasks as Van de Walle suggested. I'm wondering how shallow my student's understanding would be if I didn't read the whole framework, and just glanced at the standard. 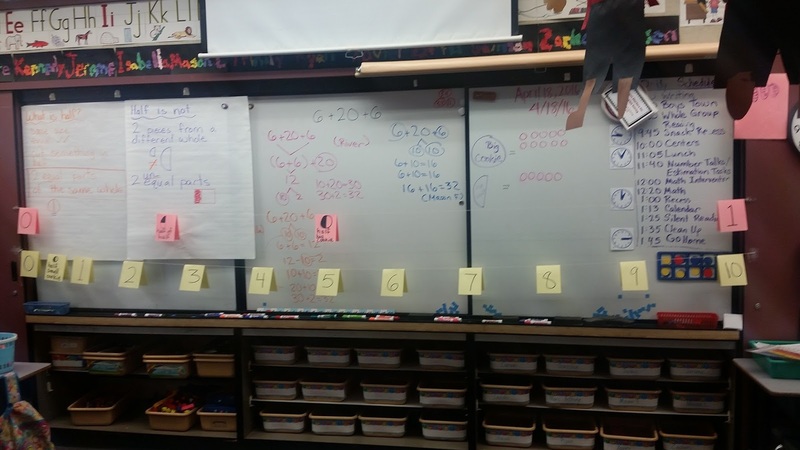 This lesson planted seeds for fractional reasoning, proportional reasoning and algebraic understanding. I'm sure I'll continue to chip away at this lesson, but I think we are off to a great start. P.S. 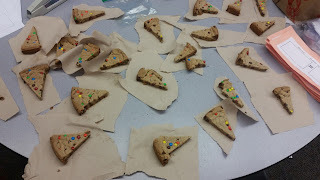 Of course, the kids had to have cookies! Thanks Matt Vaudry and John Stevens for the fun inspiration! This is fantastic! Why? Because while you may think that 1st grade standard listed at the beginning seems simple, it is not! This country is chock full of 4th grade classrooms, and 7th grade classrooms where these ideas are rehashed (and still probably not fully learned). Yet here you are, with your 1st graders, creating a tremendous lesson and executing it to perfection. Content and practices woven together wonderfully. I can only imagine what upper grades, middle school, and beyond could look like for students if teaching like this in primary was the norm. It's exciting to think about the possibilities. Keep up this amazing pedagogy, and please keep sharing! Thanks, Mark! This was probably the most fun I had teaching this year! I'm just a gardner planting little seeds. :) The kids are amazing! Yes, what a lovely lesson! And that double number line is great! It gets across the idea that not all "halves" are equal really well, and it also hints at all sorts of other things (there's a whiff of scaling up by stretching the number line in there)! It's reminded me that I need to do some number line fraction work. And also, made me look forward to teaching 5 and 6 year olds again come September! Hi, Simon! Thank you! It was a pretty effective lesson. We totally did scaling too, you're right! Didn't even think of that! 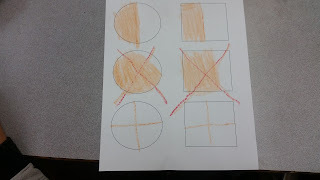 I'm wondering what fraction talks could look like in first grade after this unit. I have to admit, Jamie, you are kind of inspiring me (a Literacy Coach) to want to read Van de Wall to see if I could execute something half as awesome as this. Great lesson, Jamie! I'd echo what Mark wrote above - there are classrooms full of older students who are lacking these foundational understandings! You've created a memorable task that will help cement these key concepts for years to come. Best of all - just like in workshop at NCTM - the students were engaged in meaning making through discourse and student generated representations. Thanks for sharing! Thank you, Chris! It was a noisy day! Lol The kids were definitely in the drivers seat! Thanks, Kriatian! This was a fun lesson to teach. Now I'm working on continuing those lines of thinking throughout the rest of the unit. Awesome post Jamie! Thanks for sharing. 2-3 colors, label each line, and make it "walk-in" ready. •Each color represented a different context and can be easily communicated amongst teachers and students. •Labeling each line makes it accessible to all students so they're not guessing which line stands for what. 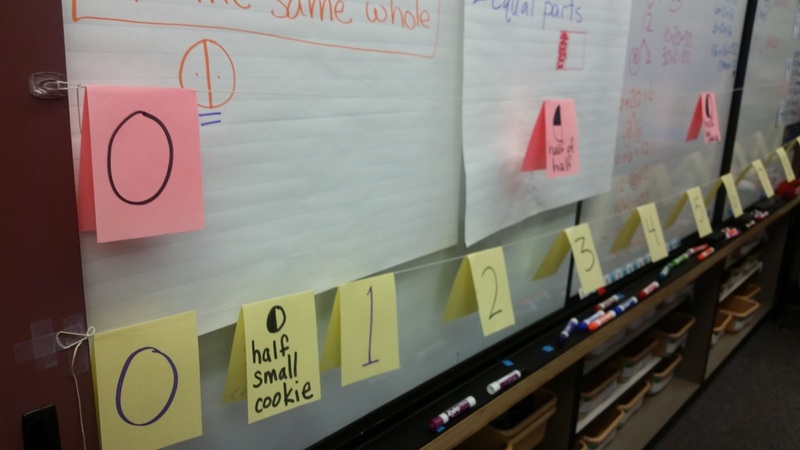 •Making it "walk-in" ready allows anyone to walk in your classroom and see that 10 small cookies equal 1 large cookie. Thank you for for inspiring me to try it! It was a great visual support for students to conceptualize the difference in proportions.I'm looking forward to using a lot more in the near future. Great work, Jamie! I loved how you let the students wrestle with the concept rather than providing an easy way out. Thank you for sharing this. Thank you! The kids and I really enjoyed this launch to the unit! Hello! This post was recommended for The Best of the Math Teacher Blogs 2016: a collection of people's favorite blog posts of the year. We would like to publish an edited volume of the posts and use the money raised toward a scholarship for TMC. Please let us know by responding via http://goo.gl/forms/LLURZ4GOsQ whether or not you grant us permission to include your post. Thank you, Tina and Lani. This post is awesome! I am looking forward to infusing "mathfights" into my classroom this year and activating student interest in math. I also want to improve my use of math journals. Do you have a resource to recommend that would give ideas how to make journals a useful tool? What do you do? Thanks in advance and thanks for posting this lesson.